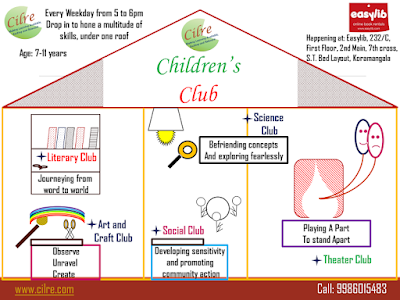 So here we have a new destination for our kids residing in and around Koramangla, 'Cilre Children's Club'. In today's lifestyle where kids are engaged to television or smart phones, exposure to children to various activities outside school is very essential for holistic personality development! Cilre Children's Club with that vision provides an environment for children to explore and nurture their areas of interests in an engaging environment. 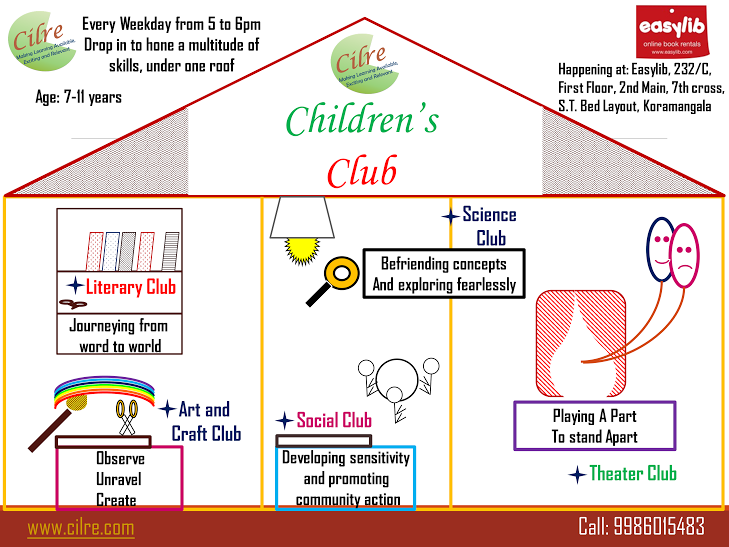 Cilre Children's Club aims to provide enrichment to children in various areas in one space. The members of this Club can be part of the Literature Club, Science & Technology Club, Civic & Social Club, Arts & Crafts Club and The Theater Club. Cilre provides a non judgmental experimenting platform for a wide range of fields which helps children to discover and nurture their interests.